Bet you never thought of Iowa as a golf destination, did you? Well, maybe you should. 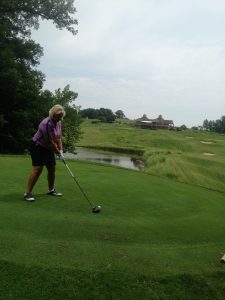 At least visits to two courses – Spirit Hollow in Burlington and Amana Colonies Golf Club in Middle Amana — during John Deere Classic week suggested that Iowa has plenty to offer golf-wise. The Amana Colonies layout is the older of the two courses. It was opened in 1989, but the area near Cedar Rapids and the University of Iowa in Iowa City already had a reputation in golf before that. 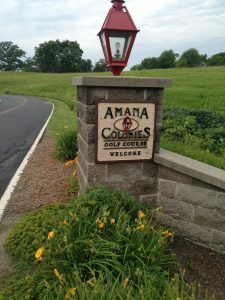 The Amana VIP tournament, which ran from 1967-90, was created by George Foerstner, founder of Amana Refrigeration, and Julius Boros, a long-time PGA Tour player who won the 1952 and 1963 U.S. Opens and the 1968 PGA Championship. The Amana Colonies course was challenging, but a most welcoming, place. Their long-popular event was a forerunner to the celebrity events put on today. 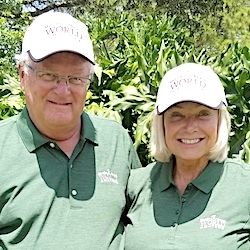 Bob Goalby, the former Masters champion, called it “the Masters of the Pro-Ams’’ and all the top players of that era – from Lee Trevino to Fuzzy Zoeller to Tom Watson – played in it at one time or another. So did celebs like ex-President Gerald Ford, Mike Ditka, Flip Wilson and Joe DiMaggio. That event wasn’t held at Amana Colonies Golf Club. It opened one year before the last Amana VIP tourney was held at the University of Iowa’s Finkbine course. Amana Colonies hasn’t had an event that big, but the 6,824-yard par-72 layout designed by William Spear on a 600-acre plot has long been considered one of Iowa’s best public facilities. Some may find the number of blind shots on the hilly layout excessive but the course has some beautiful views and successfully walks the fine line of being both fun and challenging. Unlike Spirit Hollow, Amana Colonies is a more finished project. It also includes lodging at Colony Oaks condominiums, where stay-and-play packages for one to eight guests are available adjacent to the course. The Colonies – there’s seven of them that date back to 1855 – also are a National Historic Landmark. 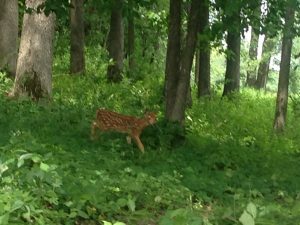 They attract visitors, golfers and non-golfers alike, all year long. Spirit Hollow, though, is where exciting new things are happening now. The Amana Colonies clubhouse makes for a nice finishing hole on a course with plenty of elevation changes. The course, designed by Libertville architect Rick Jacobson, opened in 2000. It’s been a busy place that will soon get busier. Spirit Hollow hosted the Iowa Amateur in 2000 and 2012 and was the site of the last men’s National Junior College Athletic Assn. Division I championship. It’ll host the GolfWeek Challenge, which draws 15 of the top college teams, in September. Those are big events in a town of 30,000 residents that isn’t close to a bigger city. (The Quad Cities are a 75-minute drive away and Western Illinois University is the closest big college). Oh, deer! It’s always interesting to get some unexpected visitors in the middle of a round. This was our onlooker at Amana. Spirit Hollow already has other entertainment options available. Winegard owns the Catfish Bend Inn, which is four miles away. It has a casino, water park and two restaurants and is a good place for adult get-aways, business gatherings and family vacations. 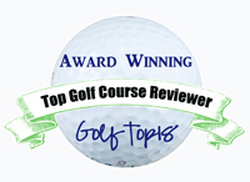 And now the golf alternative – already quite good – is getting a boost. More about the course facilities. Spirit Hollow may be the best buy in the Midwest now — $35 for seniors with cart included seven days a week. The clubhouse has an indoor hitting facility that allows for winter practice, and having music playing on a big practice range offers a nice, somewhat unusual twist. The staff there is also notable. In addition to Strieck, the superintendent is Jim Wyffels. He was superintendent at The General at Eagle Ridge before moving on to Fyre Lake and then Spirit Hollow.